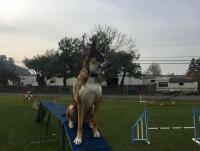 I know some of you owners do agility with your dogs-and they are very good at it- I have been doing it with Zuni for a year and a half and as far as i can tell he LOVES it - he is extremely enthusiastic and smart as a whip and fast. We are having one issue and i was wondering if anyone else encountered this and how you solved it. He is really fast and when he gets a bit ahead he barks ..like "hey hey hey come on" and jumps on me as i am running which is not normal (the jumping up) . He kind of barks or talks more than I'd like in general---like loud alerts to everything just 1-3 barks "hey look at that" or "hey you forgot me " Zuni always has something to say ... anyway all ideas are appreciated! Sorry, no suggestions or solutions...we call it "Bossy Barking." LOVE the photo! Edited by LakeGirl, 31 October 2018 - 05:53 PM. My Kai is also a bossy barker. Sometimes quite piercing I might add. Tolinka is a bossy barker as well. I've been experimenting on how to tone it down. Basically, I talk to him more, respond faster, and whisper my requests to him.....it's a slow process, but it seems to be working. It seems that when he wants something...he wants it NOW! The loud bark is to remind me that I am not paying attention and not listening to HIM fast enough. It's that communication thing again. I realize that when it all started, I wasn't listening and his bark grew louder and more piercing until I did listen. It is his way to get my attention, and it became a habit. His bark can be so piercing that it make spiders jump....something I witnessed. ha ha. So now I try to respond immediately and his bark is becoming a gentle request rather than a loud demand. It looks like my work with him is successful ......most of the time. Life is good and full of lessons to be learned. Hahahahahaha!!! The piercing bark...that's Kitchee...it's "I WANT ATTENTION NOW- THROW THE FRISBEE...NOW...CAN'T YOU SEE IT AT YOUR FEET? I THREW IT THERE"......and he does a hippyety hop dance in front of me...or the "PET ME NOW" sharp bark/whine.... Wyot, in the meantime, sounds like a tire losing air....LOLOLOLOL!!!! He looks at me with those eyes...and just does a subtle but annoying whine...if I look at him- into his eyes, and just stare, and then say NO. Go sit. He tries again, and then finally sits. Kooskie has a high pitched, piercing bark. I solved the problem by working on the quiet "woof". Hand signal and voice command "BARK", then treat. Yes, the bark. Now, the woof... Small version of the bark hand signal, and quiet command ...woof. As soon as she made any quiet sound, I rewarded her. She is pretty good at it, now.